The wet slap of a raw steak smacking a human face echoed across the courtyard as the constable made his way to Max Hardigrew’s estate, a rambling collection of 70 or so old Winnebagos connected via ramshackle wooden hallways. The constable needed Hardigrew’s help now more than ever, though he was never fond of visiting the brilliant recluse. Squeezing the bulb that activated the doorbell, Constable Bladderworth cringed as he heard the footfalls of Clamford, Hardigrew’s much-abused valet. Clamford answered the door, face still bearing the marks of the steak that had only just recently impacted his cheek. Clamford punched a button on the walkie-talkie strapped to the side of his head. A burst of unintelligible static burst forth. By the time the Constable reached the end of the ladder, red-faced, breathing heavily, and dabbing at the vomit stain on his uniform, Max Hardigrew was already installed in his large leather armchair, tearing out pages from a copy of an old Hudson owner’s manual, and filling the page with dried corned beef, which he proceeded to roll into a fat, dripping cigar. Lighting the meat-stogie, and taking a few exploratory puffs, Hardigrew motioned for the constable to have a seat on the litter of straw and old newspapers he kept for important guests. The constable plopped down heavily, causing a noticeable listing of the trailer and a series of alarming-sounding metallic groans. “Max, we’ve got a hell of a case here, and we really need your help,” the Constable began, impatiently. “Oh, I’m not so sure I’d be interested. I’m sure you’ll have it under control.” His hand reached for the button that opened the trapdoor under the filthy sitting-litter the Constable was awkwardly squatting on. The Constable began. “Here’s what we know so far: over the past two weeks nearly a dozen people have been abducted and cannibalized, all in the same manner. “Fascinating. I’d love to know what those pairings were. Tell me — was there anything notable about those cars? And you said ‘nearly’ a dozen — what do you mean?” asked Hardigrew. “Well six cars were taken, with two passengers each. In one car, one of the passengers managed to escape, and that’s how we know the method the abductor used. Also, we found a lot of caterpillar tread tracks that corroborates the story.” The Constable spread some photos of the tracks and the crime scenes on the floor between the two men. “None that we can tell. They seem a pretty random selection,” said the constable, pointing out some of the cars in the cars in the pictures — a Pontiac, two Ramblers, a Volkswagen bus, and a number of other cars. “The survivor — tell me about him? He’s the one who described how the cars had been abducted? And how did you find him? Was his car recovered?” Hardigrew asked, puffing voraciously on the corned-beef cigar before pausing to take a thoughtful bite. “Well, remember, according to this newspaper here, it’s 1972, and Citröen doesn’t leave the US market until 1974,” Constable Bladderworth added, glancing at one of the papers he was sitting on. Max Hardigrew inspected the image for a few seconds and then leapt out of his chair, impacting his head hard on the thin metal ceiling of the trailer. “Shall I get a doctor?” asked the Constable, laboriously raising to his feet. How did Max Hardigrew know who the cannibal was? Max, being an obsessive car-fetishist, was of course very aware of Citröen’s offerings. The only ‘jeep-like’ car in Citroën’s lineup was the Mehari, which had a body made of ABS plastic and would therefore have been impossible for a magnet crane to pick up. Oh, and also, Max and Mr. Gourmand did know one another, and would often meet late at night in Gourmond’s dealership break room, where they would drink cheap wine, play Pong, and describe to one another elaborate fantasies about how much they wanted to try eating another human being. 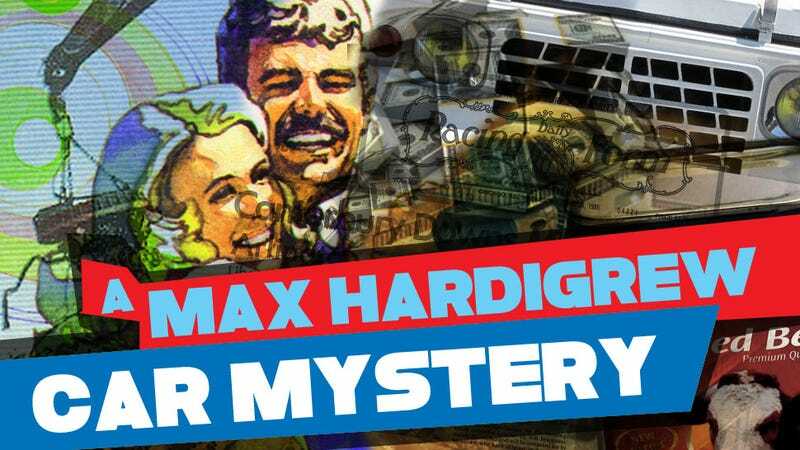 STAY TUNED FOR ANOTHER INSTALLMENT OF MAX HARDIGREW’S CAR MYSTERIES! WRITER’S NOTE: I’m on vacation, but wrote this anyway. I know we don’t really do fiction, but what the hell, right? I’m sort of basing it on these old stories that used to run in Popular Mechanics in the 50s and 60s. So, there we are. If it’s fun, maybe we’ll do more?